Reflect honestly on what is going on inside of you right now. What questions are tugging at your heart and mind? 4. Who or what inspires me? 5. What is the purpose of my life? 6. How has God been active throughout my life? 7. When do I feel closest to God? 8. How am I called to serve others? 9. Where will I best fulfill my mission as a disciple of Jesus Christ? 10. 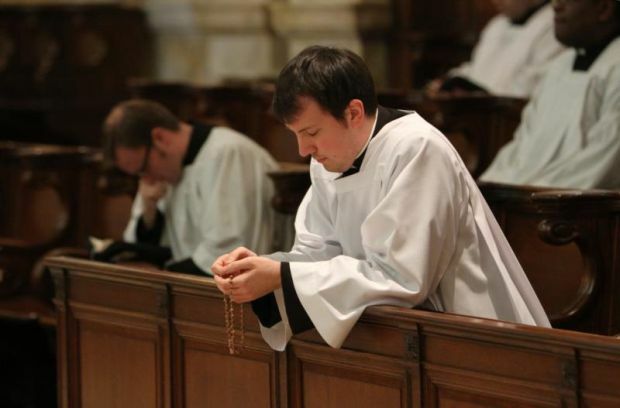 Am I attracted by the life that priests and consecrated religious live? 11. Do others tell me they see priestly qualities in me? Study the Bible, the catechism of the Catholic Church and the lives of the Saints. Look at those ordinary men and women who have wrestled with your very same questions, and lived extraordinary lives because they trusted in God. Samuel heard a voice calling his name in the night; Eli, his mentor, instructed him to respond to the voice of the Lord (1 Samuel 3:1-10). With trust, Mary willingly surrendered her entire being to the plan of our Heavenly Father (Luke 1:26-38). Saul met Jesus Christ on the road to Damascus; his life was radically transformed, and he became the great apostle, St. Paul (Acts 9:3-9). St. John Vianney struggled with his academic studies. After his ordination, he was renowned for his wisdom and spiritual guidance in the Sacrament of Reconciliation. St. Clare of Assisi, a beautiful woman who could have married any nobleman, followed her one true love, Jesus Christ. Believe that God wants to work in your life just as profoundly and powerfully as he did in the lives of those who faithfully embraced his plan throughout the centuries.